There’s tons of fun things to do in Niagara Falls and we had an hour or more to pass before a big truck full of stuff was due to arrive. This moving truck was to be unloaded at the back of a nearby building. 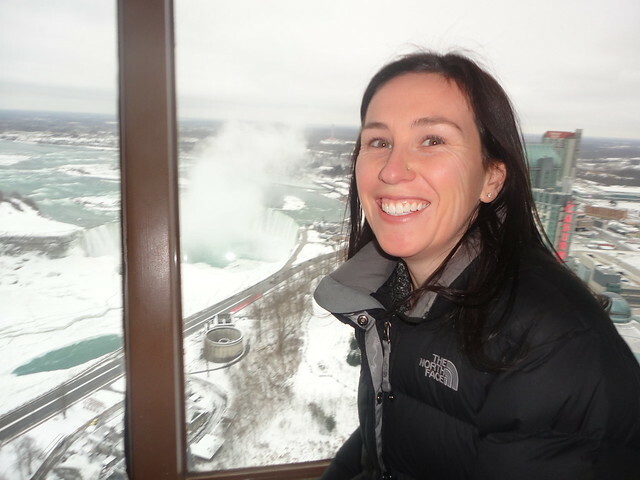 Helene has always wanted to see the local attractions, wax museums and haunted houses 3D/4D Falls Movie “Legends of Niagara Falls” but we decided that could wait until she has her nieces to do that stuff. She's a local now. Helene really likes history and already knows a lot about the area, and while driving the Falls Blvd she told me she had always wanted to go up Skylon Tower. were destined to hang out together in Canada's number one ranked tourist destination, why not make it a morning to remember? Skylon Tower in Niagara Falls, located at 5200 Robinson St. 905-356-2651 this is a place is fixture in the local landscape, and it really is a part of Niagara Falls history. Many of the gifts and souvenirs available here are quite unique collectibles and exclusive to Skylon, and that means they're not available in other stores below. The observation deck is 775 feet in the air, and yes it's possible to get outside and have a completely unobstructed view. The tower has 662 stairs, but the public are not allowed to climb them or even see them unless its during the official Skylon Stair Climb for Childrens' Cancer, and that is happening again on April 12, 2014. The elevator ride to the top takes 52 seconds. This restaurant is famous and has served plenty of movie stars and heads of state. The venue offers brunch, lunch and dinner options. Brunch is always available every Sunday all year round and there's a bigger brunch than usual in summer season. 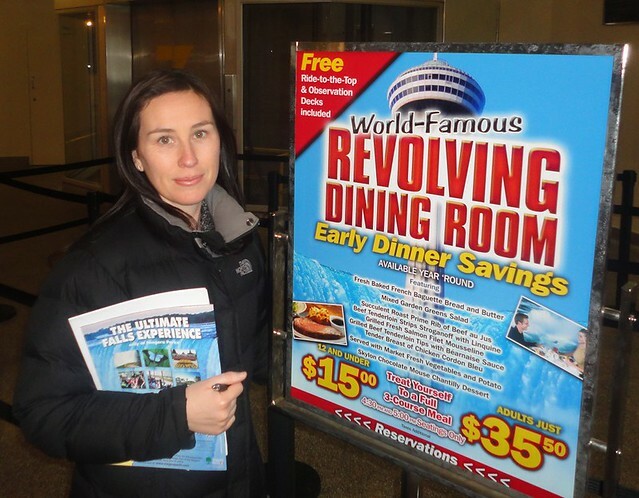 The single biggest feature is of course the revolving dining room which ensures that everyone gets a good seat. The circular venue does one rotation every hour. 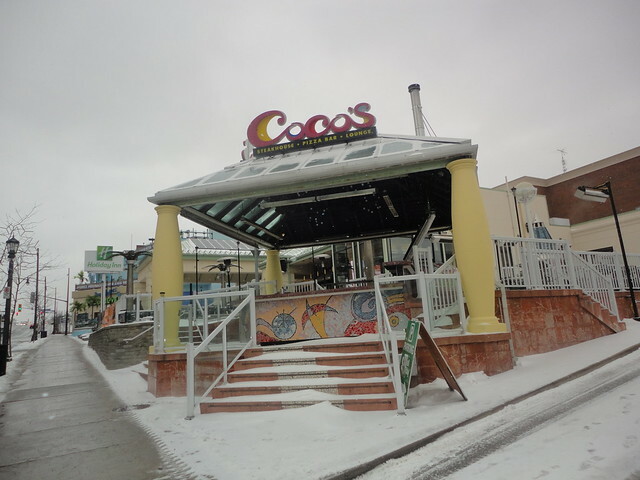 The restaurant is open year round. 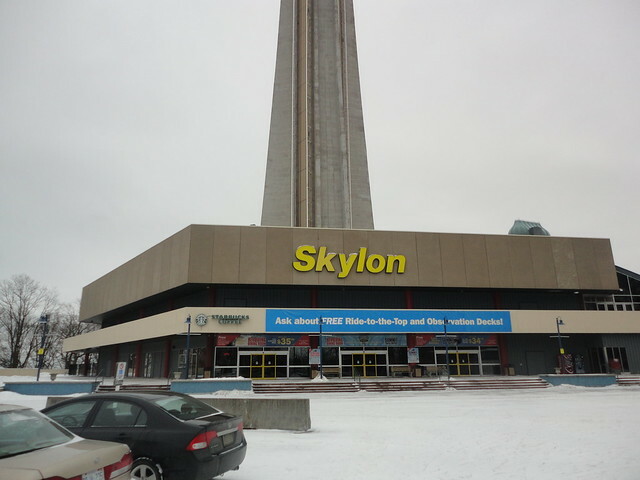 We found out from the site manager that in the summer time the Skylon Tower employs over 150 people including tourist guides, restaurant staff, souvenir shop retailers and maintenance workers. If you like vintage video games, the Arcade in the basement has lots of really old titles, including Centipede and even late model Space Invaders by Konami. Reluctantly we left Skylon to find breakfast elsewhere, and I snapped this shot of Cocos patio bar restaurant which is a legendary outdoor eatery in the summer. In the background you can see Holiday Inn By the Falls and behind that is Margaritaville bar where all we could hear through the snowstorm were odd misplaced Mexican melodies that crept out over the streets as though its July 1st weekend and the town is ripe with tourists. We ate a couple of hearty omelets in Cocos. 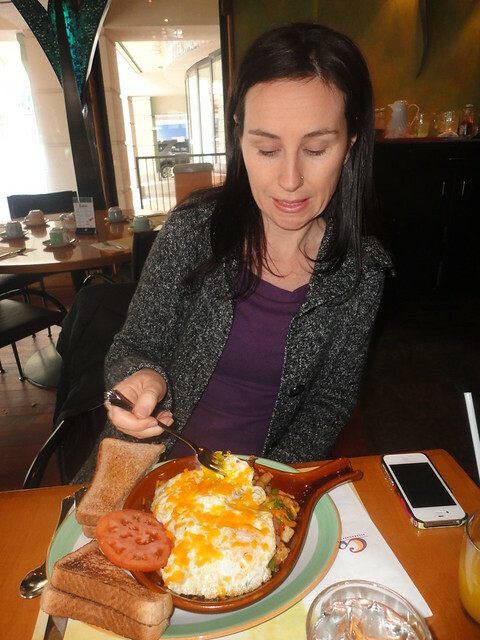 We finished our meals just as the Toronto movers arrived to take Helene to her business venture in the area. It really was a morning to remember. Contact robert hugh campbell (roberrific) - a lack of a response does not mean that you have permission to use material from this page.